Adept at prevailing without the ruts of an outward sign. Adept at speech without the flaw of banishment and blame. Adept at counting without a counting scheme. Adept at closing without locking, yet cannot be opened. Adept at conclusion without restraint, yet cannot be undone. Always adept at helping people because he discards no one. Always adept at helping things because he discards nothing. This says he follows the pattern honestly. Thus, those who are adept are models for those not adept. Those not adept support those who are adept. Neither value the model nor love the supporter. Is called an essential subtlety. Always adept at helping people because he abandons no one. Always adept at helping things because he abandons nothing. Perhaps it is time for me to stop fiddling with it and just let it be. Nailing it down is impossible… and naturally so! That is why I include the various synonyms for each character. If one doesn’t resonate, just pick one that does. 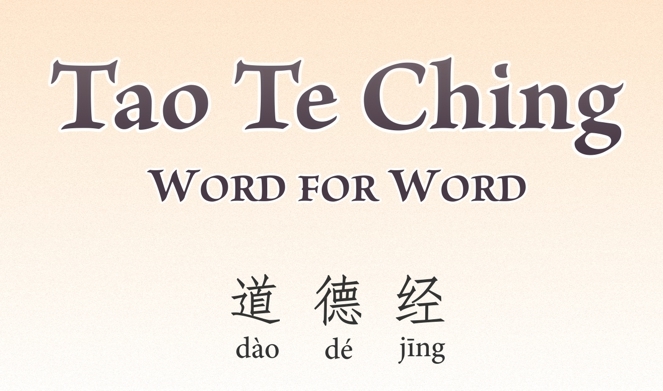 The secret to understanding the Tao Te Ching, or any scripture really, lies in interpreting it such that it reflects what you intuitively know. After all, We only understand what we already know. In other words, the Tao Te Ching can’t teach you what you don’t already know. All it can do is be a spokesman for your intuition. These “adept at” lines made sense right away except for the last one, Adept at conclusion without restraint, yet cannot be undone. Finally, I thought, I may have a correction to make, so I checked out the word-for-word section in the translation. It would make more sense I suppose to say, Adept at tying without rope, yet cannot be untied. This comes closer to how D.C.Lau put it, One who excels in tying uses no cords yet what he has tied cannot be undone. Making the view murkier forces me to ponder deeper. In doing this today, I noticed a key word — without. The ideal I see here is being adept at something without some extra baggage. In other words, conclusion with restraint is not a true conclusion. The baggage here is some form of restraint. As chapter 24 says, Such ways are called surplus food and superfluous forms. Always adept at helping people because he let’s them be. Always adept at helping things because he let’s them be. Adepts at living without ___’something’___, is simply letting ‘it’ be ‘it’. Exactly what the ‘something’ is, or what one could ‘let be’ is truly a subjective question that each of us would answer according to our needs and fears. All this reminds me of the walk in nature motto: “Take nothing and leave only footprints”. That is quite the opposite of humanity’s impact on the nature so far. The actual character in question here is ( 弃 qì) throw away; discard; abandon. Perhaps abandon would be a better choice, although I would prefer ‘let’s them be’. Nature’s process definitely has a pattern to it, and a pattern within the pattern, and within that a still more subtle pattern…and so on… or not so subtle, perhaps. What blinds us to nature’s obvious patterns is our emotional stake in life. How can any attempt to follow the pattern honestly, let alone notice a pattern in the first place stand up against our deep-seated emotional stakes in life? Always adept at letting (you name it) be, or being adept without (you name it) hinges on the emotional baggage and biases we haul through life. The importance of chapter 71 cannot be over stated: Realizing I don’t’ know is better; not knowing this knowing is disease. This disease is the greatest impediment to seeing nature’s pattern. Is this not a catch-22? It is a dilemma where mutually conflicting conditions prevent honesty. Simply said, being honest requires leaving behind the emotional baggage that offers us comfort and security. What we believe is true is the fortress behind which we shield ourselves from the vast unknown. Yet, until we suspend our belief in what is, how can we peek into the unknown? The vast unknown we dread is the “wondrous entrance” to the pattern we seek to follow honestly. As chapter 1 concludes, Dark and dark again, the multitude, of wondrous entrance. This ironic paradox brings us to the final challenge of this chapter. I see each person embodying both adept and not adept. Two sides of one coin. Every one of us excels in some aspects of life and just the opposite in other aspects. That is nature’s pattern. Yet, we hold out for a higher rung in the ladder of ‘goodness’ we pride ourselves in, and kick ourselves for our failings in the other. The Tradeoff investigates this lost soul’s dilemma we all must face. However, it is not ‘that bad’. Meaning we would not, could not, give up our gains to return to the old ways of our egalitarian ancestors. Evolution moves onward. The trick for me is having the courage to allow nature to play out on its own terms, not project my own agenda on the world. Doing that only blinds me and binds me. Life=work, struggle, gain, surprise, completion, progress; Death=rest, loss, weakness, return, boredom. As you can see, even in life, I experience forms of ‘death’, and in ‘death’ I experience forms of life. It is a full package deal, yet we continue to hold out for one without the other. The folly of linear thinking, and not realizing we don’t know. That disease and the ‘benefits’ it appears to bring prevents us from beholding the pattern and following the pattern honestly. In the final lines of this chapter, we have our entire upbringing in the hierarchical social structure of civilization to overcome in order to perceive the essential subtlety. Well, not so much overcome as see through its shenanigans. Hierarchical order is endemic in every facet of civilized life. Returning to chapter 2 helps bring us closer to the essential subtlety by exposing civilization’s hierarchical paradigm for the linear artifice it is.